Have you noticed that it has been over 5 months since our last Gameria? What?? We’ll don’t worry, we have the next restaurant all planned out and let me tell you… it’s going to be awesome! With that being said, we figured it’s about time to kick off Papa’s Next Chefs 2013! As some of you may know, the Papa’s Next Chef tournament is a yearly challenge where you, the fans, get to choose who will be working at Papa’s next restaurant! We will be showcasing 2 battles each week, one for the guys position and one for the girls position. The winners of each week move on to the next round and one step closer to becoming Papa’s Next Chefs! We would like to thank our sponsors; Dr. Cherry, Fizzo, Purple Burple, and Hyper Green for representing the four divisions this year. Let’s get this party started! 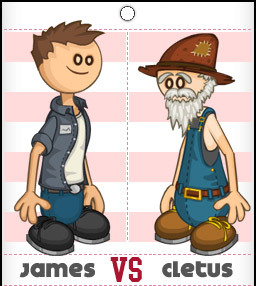 Papa’s Next Chefs: Dr. Cherry Division Round 1: James vs Cletus and Clover vs Mindy. You decide who moves on to the Division Finals and closer to becoming Papa’s Next Chefs!